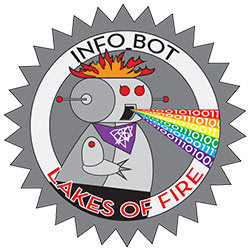 If this is your first Lakes of Fire, the Survival Guide will be your best friend and kinkiest lover. It will rub your feet, make you dinner, and tuck you into bed at night as long as you give it your full attention. Whether you just want to catch up on the latest Gate policies or you’re looking to understand the Lakes of Fire culture a little better, the Survival Guide is your one-stop shop. We fine-tune the Survival Guide every year so wee burners and crusty oldsters alike know the law of the land. There are a number of important changes from last year, so please read through it in its entirety. There were numerous proposals for Lakes of Fire: Fire & Ice’s Effigy that were all wonderfully creative and ingenious, but in the end there can be only one in 2017. Your Lakes Of Fire Effigy Council have chosen The Eggify! “This chapter of the Story on the Lake begins where the last one left off. One year ago, Gardon! The Great & Terrible was vanquished by fire on these these very shores. As LNT was sifting through his ashes, they found a strange object, so [uncharacteristically] they left it behind. Over the course of the next year this grew into a towering Egg. Inside, the symbol of fire and rebirth itself awaits: a blazing Phoenix, sealed in a shard of crystal ice, preventing its emergence until the predestined time. This thing of fire and ice, we have come to know it as the Eggify, because why not? “Eggxplorers, let its light be a beacon for you across the Lake! Upon your sixth, or even seventh lap around the track, stop a while and rest your dusty feet inside its welcoming interior. For the Eggify is beacon of chill. It’s on its ground level it is covered with fabric and pillows, and the top layer it is composed of nets and woven seating. Stay a while, share a story with someone you’ve never met. Roll around in eggstasy! Be transfixed by the shifting lights and detailed woodwork. “And this Egg – it moves, it breathes. The Bird is aching to break free of its long imprisonment. Help it, by cracking open just a little and and feel its fiery breath. These arms are dynamic and you yourself will be able to aid in the awakening. “And on that foretold day, as the last of the ice melts away, we will gather as the Egg cracks open, and we release the shackles. We watch as it becomes the Phoenix reborn. Screaming its thanks, it takes wing, to ignite the world and watch it Burn. If you’d like to bring an art car, participate in the fire conclave, bring a sound camp, promote an event in the WhatWhereWhen guide, or any of the things below, you’ll need to fill out a form. Those deadlines are coming in fast! Gallery in the Pines is an community art installation that will again take over the Art Hub pines near the entrance to Lakes of Fire 2017. Gallery in the Pines will transform the Art Hub into an enchanted forest of light and multimedia art. The Gallery will feature art made by LoF 2017 participants, with a focus on art that is not usually seen at burns: framed paintings, photographs, sculpture, writing, short stories, art books, etc. We are open to your ideas, and look forward to what you come up with! The Great Lakes Experimental Arts (GLEA) Board of Directors present the annual Afterburn report and Financial Statement for Lakes Of Fire / GLEA. As a community-focused non-profit, it’s important to us to be transparent to our attendees about where our funds are used. If you have any questions, please reach out to the GLEA board at board@lakesoffire.org. P.S. Don’t forget to submit your events (whether you’re in a theme camp or not) to theWhatWhereWhen guide! You can log in at any time to see what’s already been submitted this year.